For some years, La Sínia primary school has participated in a learning programme based upon specific project work from P3 to 2nd year classes, using cross-disciplinary study in order to acquire the relevant skills based upon constructivism and meaningful and functional learning . This is the result of this work, made and constructed in a huge network, and with the close involvement of each member who formed a part of it, with a common objective: so as to offer pupils a different perspective on their city, dicovering a point of view which cannot be found in history or art books, a point of view transmitted through direct contact with the people who form part of their city. This project was carried out in stages, supported by the university and generational assitance. With the participation of the Pla d’entorn and LIC, which helped in the collaboration of the Ajuntament de Vic and the Casal d’àvis i àvies Mossèn Josep Guiteras. 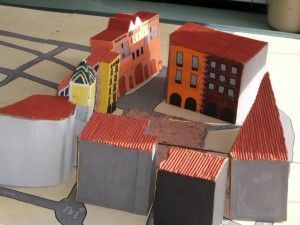 Coordinated by lecturers in the Master's Degree of Primary Education in the area of Visual Arts II, at Universitat of Vic, who helped with the construction of model buildings.